San Clemente Summer Concerts at the Pier 2012! Posted by Teresa Mihelic HelpDesk on Friday, June 15th, 2012 at 5:51am. 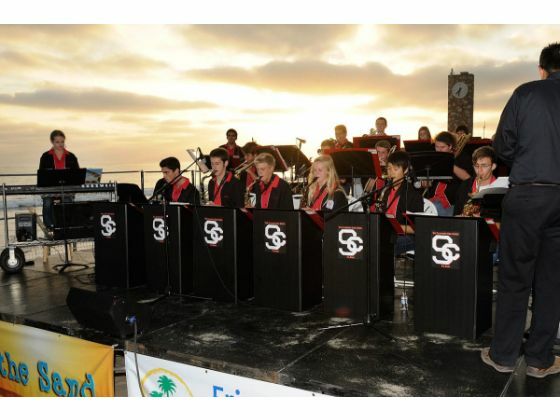 San Clemente already kicked off its summer concert series, with a great perfomance from the San Clemente High and Shorecliffs Middle School bands, who played the opener of the 13th annual beach series near the pier this past June 6th. If you missed that one, don't worry! There's three more shows are on the schedule through Aug. 23, featuring Beatles, blues and reggae music. Just like most of the events hosted by the city, the admission is free for all four concerts on the schedule, which all will run from 6 p.m. to dusk on the sand between the San Clemente Pier and Marine Safety headquarters. July 26: Paperback Writer, a Beatles tribute band. Aug. 9: Blues by Rod Piazza & the Mighty Flyers. Aug. 23: Reggae by Common Sense. This is the city recreation department's 13th annual concert series, and as in the past, you can bring your own beach towel or chair and your own food. Or you can purchase dinner plates provided by Fisherman's restaurant. The $8 meal offers barbecue ribs, chicken, baked beans, Oriental salad, sourdough bread and a drink. If you are an music and concert enthusiasts, let us remind you of the Dana Point Summer Concert Series, which we posted a previous blog here. Interested in San Clemente Homes? Follow the link and visit our San Clemente Real Estate page for information on all homes and condos available in this wonderful city.